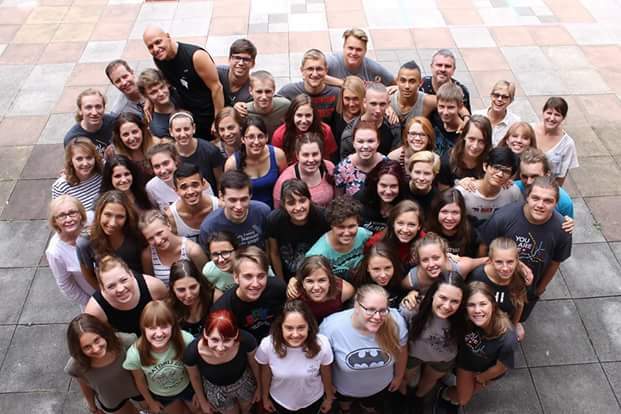 I recently returned from a trip to Slovenia where I worked with Josiah Venture’s Performing Arts Camp program with Slovene teens and young adults. The experience was life changing. Not only was I in a beautiful part of the world, but I was getting to help young men and women who don’t often get the chance to express themselves in the arts. The program creates an encouraging atmosphere that helps to push these young people forward while providing an opportunity to talk about troubles and hardships they may be experiencing in their personal and spiritual lives. I was so grateful for the opportunity and I learned some valuable lessons, not only from the program, but from these brave young men and women. We worked with these kids over the course of a week to put up a 90 min show filled with drama, singing, dancing and instrumental challenges. For some of these kids, it was the first time they had performed a certain disciplines. It was not an easy task, yet they knew they were in an atmosphere that would support them through this. The result: outstanding. The most inspiring moments came when you saw the transformation of students who started the week doubting they could get though the process. But slowly, with support and encouragement from teachers and fellow students, they grew stronger and more confident in a discipline day by day. By the final performance a week later they performed like professional artists. I find myself a week later realizing that I need to do the same thing in my own life. How many times have I talked myself out of moving forward with a project, letting the fear of the struggle keep me from taking forward motion. If a young man who has never done musical choreography can proudly do a group combination a week later in front of friends and family, then what is holding me back? A key element is to make sure that I have the support and encouragement of mentors and fellow travelers along the way. In community, wonderful results can appear. 2. It’s not about me. What a counter-cultural thought, particularly in a day and age where we are constantly focused on self and self-improvement. One of the challenges that Warren issues in that book, is that at some point in life, everyone should go on a mission to help others. It’s something that I had thought about for a long time with my wife. We weren’t sure what the opportunity would be. We had thoughts of going to Africa, or possibly going to Mexico to help build a house. When the opportunity come along to go to Slovenia and use my abilities and skills as a teacher and director,I couldn’t have received a better gift. What’s more, when you are in the middle of a different country, you realize that there is need . I may not be able to fix it all, but I can do my little part. The written word cannot express the moments of joy that I experienced. An experience like this can dramatically snap any of my own aspirations quickly into focus. Life, just focused on my own needs and my own rewards, is not life at all. Life is meant for helping others and I am so grateful to these students for showing me the way. It’s so easy to get caught up in the day to day activities of life. You keep looking at what’s in front of you that you forget why you are doing it. After my experience in Slovenia, I know that there are some incredible experiences ahead. I want to help this new family of students and friends in Slovenia. I want my children to finally meet their family and relatives in Ireland. I want to experience beautiful places in the world with my wife and sons. And I don’t have to do it just as a tourist. I can do it with purpose. Again, I am so grateful for these students and for the Slovene and American teams involved with Josiah Venture and Cross Point Community Church. I pray that you get to have an experience that can rekindle those flames. My first suggestion, think about someone you could help using your talents, and then go do it… If there is a willing heart, who knows where God will lead you. I am grateful it sent me into a community of nearly 50 people who are now a part of my family and my heart.